Furano is a particularly well known region within Central Hokkaido. It is a popular tourist destination amongst Japanese travellers, even outside of winter, with sights such as its huge fields of lavender. The reputation of Furano has also begun to rise of late in neighbouring Asian countries because of this as well. Although it has the potential to become a bustling sightseeing hotspot for many reasons, western visitors seem to only have eyes for Furano’s ski season. And, while it boasts the calibre of holding 10 FIS World Cups, most of its popularity stems from its location which draws people in for long stays here. Furano is only an hour and a bit away from Kamui by car on a good day. Compared to other snow towns, Furano is fairly large and while it is possible to find accommodation there, I decided to stay at the New Furano Prince Hotel at the base of the ski slope this time around. The Prince Hotel Group is a widely known hotel chain in Japan which owns a number of hotels inside of resorts all over the country. A little spell of bad weather added some time to my trip but I was able to reach the town before dinner. On my way to the hotel, I was treated to the beautiful night view of the ski slope which operates at night as well. Gazing out over the magnificent night lights in Furano whilst skiing must make for a unforgettable romantic experience. Upon my arrival at the New Furano Prince Hotel, I immediately made plans for dinner. Of the six restaurants inside of the hotel, I decided to eat at the sushi counter, where the sushi chef made and served sushi right in front of me, inside of “Karamatsu”, a purveyor of Japanese cuisine. Hokkaido is a prominent treasure trove of gourmet delights in Japan and is said to have the most delicious seafood in the country – so I knew I wanted to have a dish filled with seafood on my first day in Hokkaido. While I tantalised my tongue with the delicious Hokkaido sourced ingredients, I listened to what the chef had to say. He mentioned that the number of western skiers had increased substantially over the past few years and that European skiers in particular have come in droves after discovering the appeal of the powder snow in the region. Both Japan and Europe, being located in the northern hemisphere, share the same ski season. Europe has built a reputation for having numerous excellent ski resorts yet, Europeans decide to make the trip to Furano for its incomparably high quality powder snow. I continued speak to the chef with a drink in hand as I spent the night enduring my excitement over the skiing I would get to do the next day. The next morning, I met up with Scott Tovey, a course guide working at the Prince Hotel. Scott made the move from New Zealand to Furano after being captivated by the ski area in the town. He now lives there with his Japanese wife and child and goes skiing with his child every opportunity that he has. I followed closely behind Scott as he deftly skied around the slopes and obtained a general understanding of the ski field layout. Furano Ski Resort is huge and is separated in two areas – the Furano Zone and the Kitanomine Zone – with ropeways and gondolas operating in both of them. The Furano Zone has fresh snow slopes and many advanced courses for more experienced skiers and is also where the New Furano Prince Hotel is located. The Kitanomine Zone has hard courses in its the upper region and numerous spacious courses aimed at beginners at the bottom, mostly targeting family groups. At the bottom of the ski slope is the Furano Prince Hotel which offers, comparatively, more reasonable accommodation options. By the time I’d had a quick look around the ski resort, it was already lunchtime. Scott told me as we had lunch. He showed me, on a map, all the areas I could ski in and then left me to go back to work as soon as we finished lunch. Scott left me with the impression that, though he could not go with me to the off-piste and backcountry trails, I was more than welcome to explore them myself if I saw fit. The backcountry trails would require registration of sorts so I’d only be exploring the off-piste trails on the outskirts of the slope. I headed towards the Downhill Romance #3 chairlift in the Furano Zone. I could see the wonderful off-piste trails as well as skiers and snowboarders dotted around the place as I rode my way up. Though the powder snow had been disturbed in some areas, there were still some places with untouched snow, granted the right course was chosen. After hopping off the chairlift, I tried to contain my excitement as I leapt straight into an off-piste trail. I felt as if I was floating as I skied down the powder snow slopes. Being able to experience such high quality powder snow directly off the chairlift was amazing. I skied through the powder snow over and over again to my heart’s content. Satisfied after a full day of skiing, I took a dip in an onsen and then set off for “Ningle Terrace”, a shopping district inside of a forest right next to the New Furano Prince Hotel. Inside of the area surrounded by trees, were various accessory and craft shops which were gently lit up when the sun set, bringing a romantic atmosphere to the place. There were also illuminated courses and snow tubes to shred as well as ice bars amongst the numerous attractions for people young and old to enjoy. There was plenty to do at night around the hotel to pass the time. Afterwards, I decided to venture out to the town of Furano as well. The Prince Hotel at the bottom of the Furano ski slope is the most dominant, eye catching hotel in the area. However, there are various inns, businesses, restaurants and bars in town which line the mountain, bringing character to the area and making it popular amongst skiers with extended stays. Many people choose to base their trip in the well serviced city of Furano and take day trips to the surrounding areas during their stay. 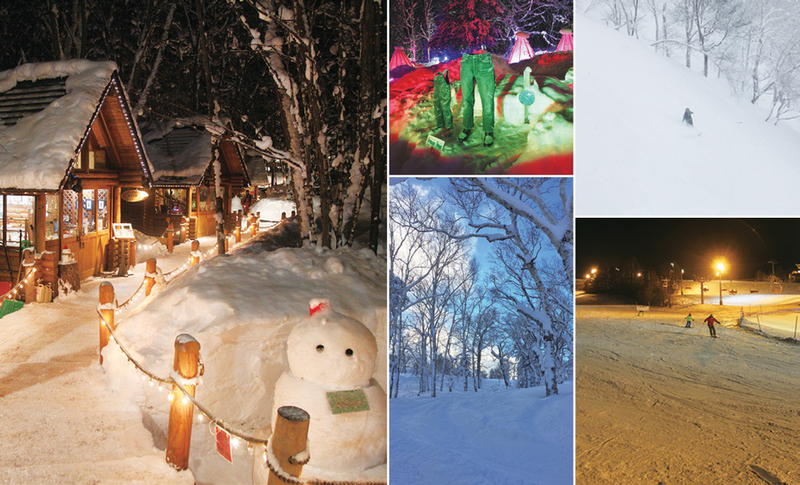 Furano is not a big city by any means, yet it still boasts a bustling entertainment district lined with numerous bars. Of these bars, “ROBATA” is a particularly popular izakaya known for its authentic Japanese style. Seats surround the fireplace in the middle, giving off a truly traditional Japanese atmosphere. ROBATA has gained popularity in recent years amongst foreigners looking to experience Japan in the most authentic sense. Its reasonable menu options also help to feed its popularity. There’s a lot of potential to be had in the Furano nightlife. On the other hand, getting too caught up in all things Japan can be exhausting to some, so there is also a western-styled pub for those who need a little taste of home. “AJITO” is a pub located not too far from the Furano Ski Resort which comes complete with billiard tables. On the day of my visit, it was filled with foreign tourists having a good time. The variety of after skiing entertainment options is one of the many reasons for Furano’s popularity.